Paris is just a few more miles away and the bar in the Hotel Mercure in Troyes is once again buzzing after another great day on the road. 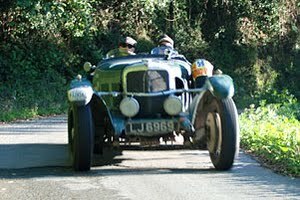 The route for the final full day of Peking to Paris 2010 left Aix-les-Bains along the shores of Lac du Bourget before striking north into the hills of the Bugey through classic rallying terrain en-route to the Circuit de Bresse for the day’s only Time Trial. Watched over by enthusiastic local spectators, competitors enjoyed a 2-lap test around this great circuit. To add a little spice to the competition William Medclaf and Rudi Friedrichs entered into a private wager over who would take best time… with a bottle of champagne at stake for the winner. Results will be announced tomorrow evening but the rumour is that they were separated by hundreths of a second. After the circuit, crews enjoyed a relaxed run on fast-flowing, traffic free roads basking in the glow of the late afternoon autumn sunshine. Many arrived into Troyes after dark having spent a couple or hours exploring the fine collection of cars and historic airplanes at the Chateau de Savigny, site of one of the day’s Passage controls. Others wiled away a few hours over a leisurely 7-course lunch. With all crews now within striking distance of Paris, there is a mood of eager anticipation tonight ahead of tomorrow’s arrival in Place Vendome from 1pm.